Scott Edwards is Alexander Agassiz Professor of Zoology and Curator of Ornithology in the Museum of Comparative Zoology at Harvard University. 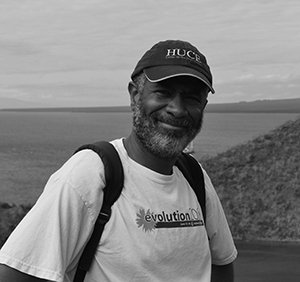 His research focuses on diverse aspects of avian evolution, including evolutionary history and biogeography, disease ecology, population genetics and comparative genomics. He received his PhD at UC Berkeley and the Museum of Vertebrate Zoology in 1992, working with the late Allan Wilson. He has conducted extensive fieldwork in Australia, producing some of the first phylogeographic analyses there based on DNA sequencing. As an Alfred P. Sloan Postdoctoral Fellow in immunogenetics at the University of Florida he studied molecular evolution of the major histocompatibility complex (MHC) of birds, work that led him to study the evolution of avian genome size and structure. He has long-standing interests in methods for estimating phylogenetic trees from multilocus DNA sequence data. He is currently using comparative genomics to study the genetic basis of phenotypic traits such as feathers and flightlessness.